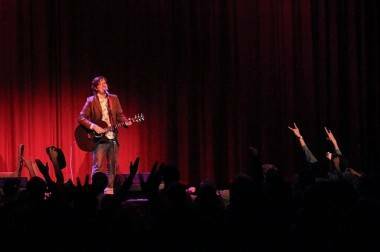 The Mountain Goats kicked off their West Coast tour last night, playing to an almost sold-out Rio Theatre in Vancouver. Except it wasn’t the Mountain Goats, exactly – at least, not the touring version (usually a three-piece) fans have come to know and love. For this series of dates, the band is, simply, John Darnielle – the man who invented the group as a name to put on homemade cassettes as he honed his songwriting skills in the ’90s. The solo format is a completist’s dream, however, and allows Darnielle to play any and all obscurities he might decide on. Last night, it became a running joke, how he didn’t know what he was thinking when he decided to add, a few days before, songs that he couldn’t remember how to play. So the start was rocky, as he admitted, but the East Vancouver theatre was full of the forgiving faithful, not one of whom came for a tight show. People who love the Mountain Goats love the band for Darnielle’s lyrics as much as his quaking voice, if not more, and his improvised between-song tangents and stories are often a match in their intelligence and wit for the words that he (one presumes) labours over in his songs. With no other band members to reign him in, this was the Director’s Cut version of a Mountain Goats show, where Darnielle was free to introduce and offer just enough of an explanation for each song. Of course – there are plenty of other singer/songwriters whose raconteurship brings people out to shows as much as the music. Where the Mountain Goats frontman has carved out a particular niche is in his brand of soul-baring and even self-myth-making. For instance, he addressed an assumption some listeners have made – that his stepfather was a drunk. A song lyric in one song in particular might lead people to believe this, Darnielle told us, but in truth his step-dad – with whom the songwriter did have a fraught relationship, which informs at least a few of his songs – was actually diabetic and couldn’t drink. As for the show itself, and the actual music and songs played – Darnielle mostly accompanied himself on acoustic guitar, though he did sit down at an upright piano for a few songs, including “Thank You Mario But Our Princess is in Another Castle”, a sympathetic ballad about the video game character’s unending quest. Other songs (though not necessarily in order): “Fault Lines” from All Hail West Texas (2002); “Ox Baker Triumphant” (along with an anecdote about going up to Portland to watch professional wrestling and Rowdy Roddie Piper); “Never Quite Free”, from last year’s All Eternals Deck; “Ezekiel 7 and the Permanent Efficacy of Grace”, from 2009’s The Life of the World to Come; and “You Or Your Memory” and “Song for Dennis Brown”, from 2005’s The Sunset Tree. The encore gave the pent-up crowd a long-awaited opportunity to shout out requests, and this they did; “No Children” seemed to be the favourite (a slip-mat with the phrase was actually for sale at the merch table). However, Darnielle came back with “Color In Your Cheeks” from All Hail West Texas (which also features “Best Ever Death Metal Band”). But the last number was one that apparently isn’t on any Mountain Goats album, and which Darnielle has performed in Vancouver before. A song about suffering through high school to have a better life, it featured the musician’s most impassioned strumming and singing of the night, and damned if he didn’t seem to break down at the end – in a good way – before our very eyes. 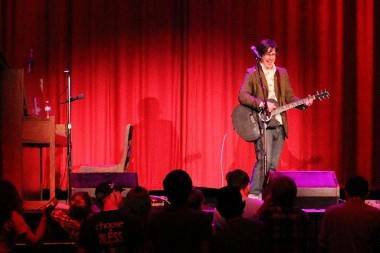 This entry was posted in concert reviews and tagged concerts, John Darnielle, Mountain Goats, rio theatre, Vancouver. Bookmark the permalink.